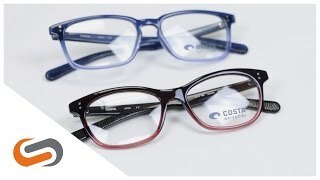 Costa Mariana Trench 100 prescription glasses from the new Costa Optical line showcases carefree comfort and style. These Costa prescription glasses are constructed with handcrafted, lightweight frame material, delivering a full outline that puts style first. If you're looking for a bold, durable, squared frame, Costa Mariana Trench 100 prescription glasses are calling your name.